Rincon peak is one of the outstanding peaks in the Tucson area. It is the main attraction of the tiny Rincon range, just southeast of Tucson. At 8482 feet, it's actually only the second highest point in the range, but the higher peak is even more inaccessible and does not offer the sweeping 360 degree views of Rincon Peak. Rincon Peak is probably only visited by an average of one party a day throughout the year. 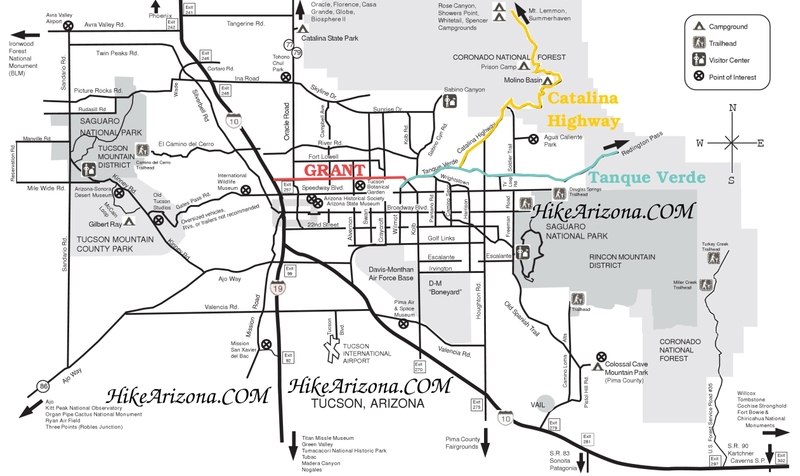 Although just a few miles outside of Tucson (as the crow flies), it is over an hour drive from Tucson - the last 12 miles of which is over a very rough gravel road. This makes the peak more isolated than it would seem. Besides the incredible views from the peak, I find the hike up Rincon Peak to be one of the most unusual and diverse trips that I know of. The ascent to Rincon peak is a long and often very steep journey through several distinct ecological areas. At about 4200 feet, the trip begins in chaparral country with oaks and manzanita instead of cacti. The trail winds its way through the endless fields of boulders, oaks, pines and manzanita. This is followed immediately by a lush, shady riparian area, then immediately again by a cool alpine zone. Then it's back up through a higher chaparral zone and back into a pure alpine environment. At the very beginning of the trail, at the edge of the parking area, there is a gate. Just past the gate, there are two trails - follow the trail to the left - the Miller Creek Trail. For the first mile or so of the trail, you criss-cross a creek bed on a relatively flat trajectory surrounded by large hardwood trees. After a mile or so, you begin a long, steep trek up the side of the mountain - winding through a seemingly endless field of large boulders. The trail is more or less carved out of the solid rock, winding its way south-westward through the rocks. As you travel up the field of boulders, you get sweeping views of the valley below and to the east, and a stunning rocky cliff to the west. Eventually, you top out on a ridge and begin traveling south towards Rinocn Peak. This area is a surprisingly lush, shady riparian zone, making for a nice respite from the more exposed chaparral below. There is a pretty creek bed in here which will have flowing water in a wet season. Soon you climb up and out of this area to the top of another saddle, and catch your first glimpse of Rincon Peak since the beginning of the hike. At this point you are about half way there, but Rincon peak still looks very tall and far away - it's a rather dramatic sight. About here you will encounter a Forest Service sign. The Miller Creek Trail ends and you can take the Heartbreak Ridge Trail either north or south. Just keep going straight (south) at this point. You quickly descend into another stark change of scenery, along a mercifully flat stretch through a canopy of huge pine trees. There are some very old pine and juniper trees here. This being about the 1/2 way point, it would be a good spot to rest or have lunch in the shade. About 1/2 mile into the pine forest, you'll see another FS sign where the Heartbreak Ridge Trail ends, and you can take the Rincon Peak trail either west or south. Take a left (south) here. The trail begins another long, steep trek upwards - out of the pine forest and into a mixed chaparral and pine area. You're accompanied by scores of manzanita during most of the trip. The manzanita seem to get bigger the higher you go - some as tall as ten feet with trunks a foot thick. From here you'll be treated to more views of Rincon Peak and dramatic views to the north and west. The trail will eventually leave the chaparral and enter the pine forest which continues to the peak. At first, this last section is fairly steep. But the last 1/2 mile or so is extremely steep, winding it's way up through about a 45 degree slope. This will really put your legs and your lungs through a workout. Finally, you emerge near the top of the peak. Follow the trail up and around the top of the mountain and up on the rocks at the top of the peak. The very top can be a little confusing - the trail can be hard to follow in the more or less solid rock. Keep an eye out for cairns to help you find the very top. 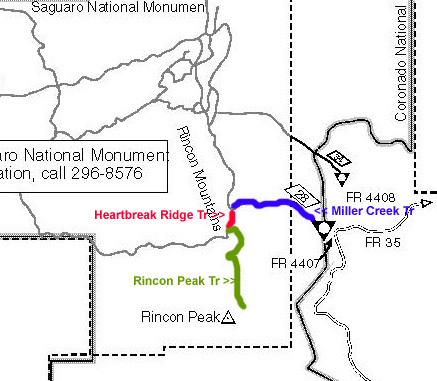 Once on top of Rincon Peak, you will be treated to an unobstructed 360 degree view of the area. It makes for a great viewing platform as there is plenty of flat, bare rock to run around on. There's also a huge cairn up there (over 6' tall) to mark your arrival. The view from the peak is similar to Mt. Wrightston in the Santa Ritas in that it's almost like looking out of an airplane window. Standing on the top of a small mountain range, the view is not as remarkable for nearby features as it is for all the distant mountain ranges in all directions. From Tucson, head east on I-10 for about 35 miles to exit 297 for Mescal. Turn left (north). Just follow this road for sixteen miles all the way to the Miller Creek trailhead. The first four miles of the road are paved and the next twelve are gravel. The gravel road was grated recently but can still be a little bone-jarring. A passenger car is fine, but you will need to go slow. After the twelve miles down the gravel road, you will see a sign for the Miller Creek trailhead. There is a small parking area here. Park here, and the trailhead is right there.